On Memorial Day weekend, 2013 Save the Harbor / Save the Bay released its second annual Beaches Water Quality Report Card on the Boston Harbor Region’s public beaches from Nahant to Nantasket that are managed by the Department of Conservation and Recreation (DCR). The report card is based on an in-depth analysis of thousands of samples taken by the DCR and the Massachusetts Water Resources Authority (MWRA) in 2012. The samples were collected at 34 testing sites on public beaches in 9 communities including Nahant, Lynn, Revere, Winthrop, East Boston, South Boston, Dorchester, Quincy and Hull. The report card is based on methodology developed by the Save the Harbor/Save the Bay’s Beaches Science Advisory Committee (BSAC), Co-Chaired by Dr. Judy Pederson of MIT’s Sea Grant Program and Dr. Jim Shine of the Harvard School of Public Health. “2012 was a good year for most of the Boston Harbor region’s public beaches, with more than half earning either an A or an A plus,” said Bruce Berman, Director of Strategy, Communications and Programs at Save the Harbor/Save the Bay, which produced the report. 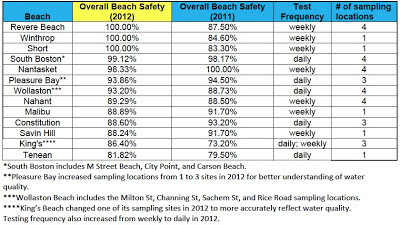 Overall Beach Safety on theses beaches increased from 88.82% in 2011 to 92.90% in 2012. South Boston’s beaches once again topped the list of beaches tested daily, at 98.17%, followed by Pleasure Bay at 93.86% and Wollaston Beach in Quincy at 93.20%. followed closely by Nantasket Beach in Hull at 98.33%. King’s Beach in Lynn and Swampscott scored 86.40% in 2012, up from 73.20% in 2011, while Tenean Beach in Dorchester scored 81.82% in 2012, up from 79.50% in 2011. Constitution Beach in East Boston scored 88.60% in 2012, down from 93.20% in 2011. 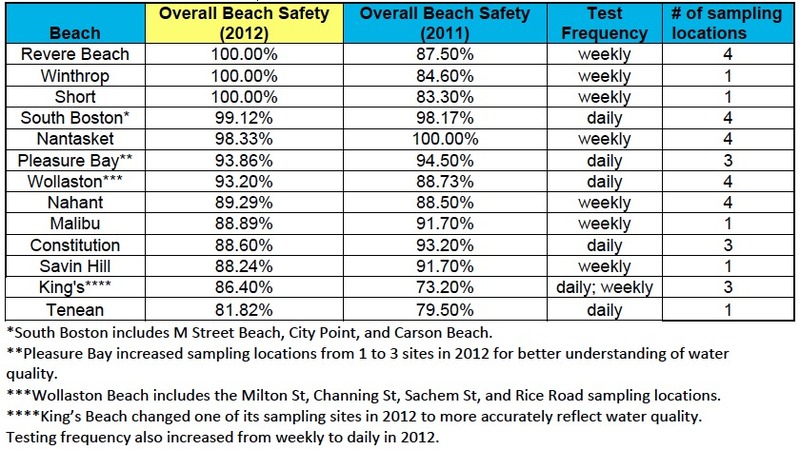 Malibu Beach and Savin Hill Beach in Dorchester scored 88.89% and 88.24% respectively, a slight decrease from 2011. Nahant Beach scored 89.29%, a slight increase from 2011. 2012 was also a dry year, which explains most of the changes we saw from 2011. Bacterial pollution is often caused by storm water discharges that accompany summer showers, squalls and storms, so less rain means cleaner water. In addition to drier weather, other factors have affected the results as well. In 2012, there were changes in the testing procedures at King’s Beach on the Lynn-Swampscott line and at Pleasure Bay in South Boston, where daily tests and new testing sites have given us a better picture of the water quality situation on those beaches. In 2012, officials in Lynn and Swampscott identified and corrected illegal connections and broken pipes. 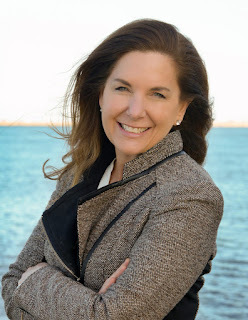 They have agreed to meet this summer to discuss ways in which they can work together to address the persistent pollution problems at King’s Beach on the Lynn-Swampscott line. There have also been efforts to address the outstanding water quality challenges at Tenean Beach in Dorchester, where Boston Water and Sewer has identified and corrected illegal connections that may improve water quality this season. Overall flagging accuracy improved somewhat in 2012, as a direct result of DCR’s continuing efforts to develop more accurate models for beach management on a beach-by-beach basis. While specificity (blue flag accuracy) is fairly high on many beaches, sensitivity (red flag accuracy) continues to be problematic, with less than 50% of the red flags posted correctly on some beaches in 2012. Beach testing, posting procedures and flagging accuracy continue to be a challenge on these beaches, as they are elsewhere across the Commonwealth and the country. This issue needs to be addressed if we are to protect both the public’s health and their right to enjoy the benefits of our region’s pubic investment in clean water and better beaches. In 2013, Save the Harbor will continue to work with the Metropolitan Beaches Commission (MBC) and the DCR, MWRA, EPA, DEP, the Massachusetts Department of Public Health (DPH) and the Beaches Science Advisory Committee to develop more accurate models to better predict when to post or flag a beach. “At Save the Harbor/Save the Bay our goal is clean water and not simply better models or faster and more accurate test results. We are working towards the day when there is no need for flags at all,” said Berman. Save the Harbor / Save the Bay would like to thank Dr. Jim Shine and Dr. Judy Pederson, Co-Chairs of our Beaches Science Advisory Committee, Dr. Andrea Rex and Kelly Coughlin of the MWRA, DCR’s Gary Briere, and Save the Harbor’s Staff Assistant for water quality Jacqueline Sussman for their help with this report. Save the Harbor's interns Amanda, Jess and Jackie on the Fish Pier. My name is Amanda Gourgue, and I love the beach and my community! Like most college students contemplating their future, I found myself staring into a never-ending abyss of internships and applications. My mind was in a state of chaos by the sheer volume of choices in front of me: Where do I begin? Do I do this or that?! Finally caving, I went to my school advisor and she asked me the one question I had overlooked: What do I want to do? Her question touched upon the foundation of internships. They are a chance for students to work in different organizations and gain hands on experience they wouldn’t have otherwise gained in the classroom. It is a great opportunity to find out what is right for you. Being a beach lover and dedicated to the improvement of my community, I was able to find my niche at Save the Harbor/Save the Bay! Interning here has enabled me to identify career strengths and skills that I could build upon and use in future workplaces. Additionally, I’m also able to help my community, see the ins and outs of the non-profit sector, work with an amazingly dedicated team and in the process have fun! A highlight thus far was being able to see the rewards of our hard work at our organization’s yearly corporate fund-raiser, Destination Boston Harbor. We had a chance to honor Boston Harbor Heroes, who help to make our harbor great. We were also able to exceed our fund raising goal, which will help support the work we do which is so important to our community. My internship has also brought my in contact with other interns from all over: Jackie, a graduate of Boston University, was able to turn her internship into a job as a water quality analyst. “I liked the fact Save the Harbor combines environmental awareness with community building” Jackie says. Another intern, Jess, a graduate of Eckerd College, was attracted to Save the Harbor/Save the Bay after participating in environmental relief near her college in Florida. “Not only does this organization work on public policy to improve marine environment, they also change the life of thousands of youth each year” say Jess, who will be helping out with Save the Harbor's youth environmental education programs this summer. I also enjoyed working with our other interns Andrew and Guillermo, as well as with Matt, Sue, Rajani, Becky and the rest of the staff - including Bruce and Patty, who all really care about the work we do, and want us to succeed in school and in life. Besides getting to meet and work with these great people, what interning has taught me is the importance of community. Our beaches and harbors here in Boston are an important source, not only for marine life, in uniting our citizens who are able to enjoy it together. I hope to see you soon on the harbor, the waterfront or on the beach.